Last edited by MRGhidini on Tue May 23, 2017 2:10 am, edited 1 time in total. simple and functional interface with 2 to 4 clicks is ready. working with PKG and original games. Copycat >_> But.. i am curious on one thing.. how did you make a progress bar on extracting / creating backups PSVIMGTOOLS is a command-line tool, and the command line dont have a progress bar.. so.. how exactly did you do that..? your code doesnt appear to be open src. mhm brb decompiling..
ALSO: your listingall files in qcma/APP/AID/ as a backup instead of just backups.. try chec\king for an sce_sys folder and if the folder name is 9 characters long xD then it should stop listing _TEMP as a "backup"
another thing: your uricaller is acturally completely useless.. to get uricaller 3.63 working u acturally need to modify app.db to make all uri's accessable via the browser. also noticed for whatever reason. 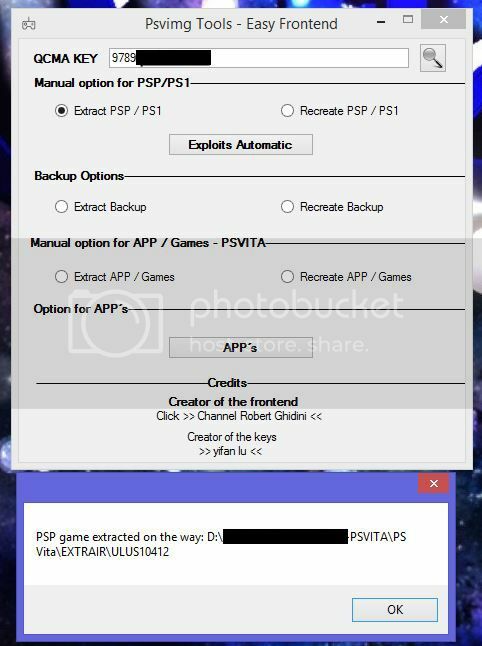 your tool cannot extract PSM Games.. Why? Your netflix installer doesnt work. i try to launch it "Please update the application"
goto update "The latest version is allready installed" and its stuck in a forever looop. SilicaAndPina wrote: Copycat >_> But.. i am curious on one thing.. how did you make a progress bar on extracting / creating backups PSVIMGTOOLS is a command-line tool, and the command line dont have a progress bar.. so.. how exactly did you do that..? i just said copycat because its kinda like what i made, didnt mean it as anything..